We’d love your help. 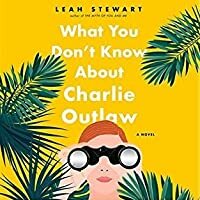 Let us know what’s wrong with this preview of What You Don't Know About Charlie Outlaw by Leah Stewart. As Charlie struggles with After a series of missteps in the face of his newly found fame, actor Charlie Outlaw flees to a remote island in search of anonymity and a chance to reevaluate his recent break-up with his girlfriend, actress Josie Lamar. But soon after his arrival on the peaceful island, his solitary hike into the jungle takes him into danger he never anticipated. 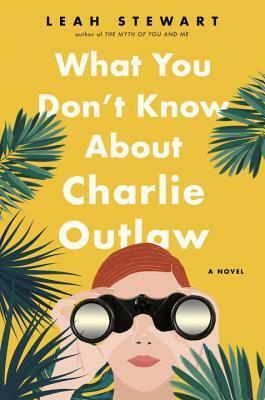 To ask other readers questions about What You Don't Know About Charlie Outlaw, please sign up. After one bad interview, actor Charlie Outlaw manages to alienate the viewers of his hit tv show and to lose his girlfriend in one felt swoop. In an atempt to regain his focus, Charlie takes off to a secluded island, turns off his phone and hopes no one will recognize him. But what was supposed to be a tranquil getaway takes a harsher turn. Now Charlie finds himself in a situation much more precarious. Meanwhile Josie Lamar, Charlie's ex, is trying to reboot her career after being the star of a After one bad interview, actor Charlie Outlaw manages to alienate the viewers of his hit tv show and to lose his girlfriend in one felt swoop. In an atempt to regain his focus, Charlie takes off to a secluded island, turns off his phone and hopes no one will recognize him. But what was supposed to be a tranquil getaway takes a harsher turn. Now Charlie finds himself in a situation much more precarious. Meanwhile Josie Lamar, Charlie's ex, is trying to reboot her career after being the star of a cult following tv show that aired twenty years ago. A few guest spots are now the best Josie can aspire to and the break up does not help matters. Both Charlie and Josie struggle to find their place. I pick books based on the theme and/or author. In this case, however, it was the cover that got me. Based on the bright yellow of the cover and title, I expected a light read that dealt with pop culture and celebrity. I was right on the second count but this book was not exactly a light hearted, entertaining read. Charlie Outlaw has new found fame after staring in a popular tv show. On the other hand, Josie Lamar, had fame twenty years prior due to her hit show. Now she is lucky to have guests spots in current tv shows. Charlie and Josie are one of the 'It' couples of the moment but a few misguided comments put Charlie in a compromising spot. His getaway is meant to help him clear his head but he finds trouble instead. Its tricky to pinpoint the tone of this book. It has funny moments, some more serious ones, there is some romance and yet at times it reads in a sarcastic & satirical way. It speaks about the way people view celebrities and brings up some valid points. I did like the third person, omniscient narration but never quite got pulled into the story. Let me put it this way, did not dislike the book but I know that its also something I will not have a desire to re-read at any point. Overall, it was just okay. Considering I chose it because the cover looked nice, maybe I should consider the whole don't judge a book by its cover. This story may very well get better but since I feel like I've wasted my time reading 60 pages when that time couldve been spent reading something I love, I'm giving up Ugh. I love everything that Leah Stewart writes and this was no exception. I loved the inside into the actor's world--so fun! A great read. The idea of two actors who specialize in playing self sufficient characters caught in a real life crisis sounded like it could be interesting. It wasn't. The story is told in present tense and the thoughts that run through the actor's minds are both boring and repetitive. They need better writers for their real life roles. Charlie Outlaw is a famous TV actor who wants a break from his fame and takes off for a remote island. There he is kidnapped not because he's famous but because he's American. The idea of two actors who specialize in playing self sufficient characters caught in a real life crisis sounded like it could be interesting. It wasn't. The story is told in present tense and the thoughts that run through the actor's minds are both boring and repetitive. They need better writers for their real life roles. The kidnappers have no real plan in mind. One of them wants to stop American development on the Island. Others want to ransom the captives. Others are kidnapped with Charlie but we never hear about them again. What happened to them? Did they save the Island from development? I am not sure. Charlie Outlaw is a famous TV actor who wants a break from his fame. So he heads off to an unnamed tropical island and ends up getting kidnapped. I picked the book for its cover thinking it would be a light and fun read. But not so much. It was a tense, dramatic and dark read. There was too much repetition and too many unnecessarily details. Just didn’t do it for me. The best part of this book was the cover design. The only thing I didn't like about this book was how late it kept me up each night reading! Seriously. I've long been a fan of Stewart's work, all the way back to THE MYTH OF YOU AND ME, and this is my favorite of hers hands-down. She tackles the inner-life of two actors with depth, complexity and humanity, while also ramping up the tension in each chapter, as we race to determine the fate not just of Charlie Outlaw but of his relationship with Josie and the love between them as well. There hone The only thing I didn't like about this book was how late it kept me up each night reading! Seriously. I've long been a fan of Stewart's work, all the way back to THE MYTH OF YOU AND ME, and this is my favorite of hers hands-down. She tackles the inner-life of two actors with depth, complexity and humanity, while also ramping up the tension in each chapter, as we race to determine the fate not just of Charlie Outlaw but of his relationship with Josie and the love between them as well. There honestly wasn't a moment I didn't love. If the omniscient narrator takes you a few chapters to get used to, keep going...I could see how people might think this will keep them one step removed from the characters, but Stewart pulls off the masterstroke of making us both care and root for them through this voice, while also giving an understanding to all of the more minor characters at play. Just didn’t do it for me. Never connected with any of the characters. I thought this was going to be a lot more lighthearted than it was. The cover is so light and fun, I guess I expected the story to be, too. But not so much. This book is not bad, but I just never really felt connected to the characters. I had trouble understanding them and their motivations, so I never felt invested. Just a meh read for me. Being a famous actor can't be easy, especially when your also famous girlfriend call it quits. Charlie Outlaw seeks refuge on a remote island off the grid, but getting away soon turns into an adventure even his acting skills can't get him out of. This thoroughly enjoyable suspense/thriller kept me guessing as it well illustrated being a beloved actor isn't all it's cracked up to be when you still have real problems. As I never imagined I'd be able to guess what it's like from their perspective - Being a famous actor can't be easy, especially when your also famous girlfriend call it quits. I wanted to enjoy this book. In fact, there was a glimmer of hope in what I did read of this book. I got a third of the way in and put it down; intending to pick the book up again. Yet, when I got the time to do so, I felt no rush or need to want to pick it back up. What I craved the most was humor and character connection. I didn't really experience either of these things from the bit that I read. Also, the story seemed to more slowly and without really rhyme or reason. With some more spit and I wanted to enjoy this book. In fact, there was a glimmer of hope in what I did read of this book. I got a third of the way in and put it down; intending to pick the book up again. Yet, when I got the time to do so, I felt no rush or need to want to pick it back up. This was a koooky, unusual pick, but an enjoyable summer break. For me, the draw was to the lives of actors -- a world in which I was once enjoyably entrenched -- so there was a familiar comfort to the characters. The plot was barely believable involving a kidnapping on a mystery island, but I couldnt help but enjoy the ride. I tried with this book-it sounded like a great premise. I read 30 pages and was literally bored to tears. I already hated the characters because nothing was happening and with so many other books to read, I just could not continue. This is a tedious and uneven info-dump. Josie is a fading former TV star whose heyday was 20 years ago. Her younger boyfriend, Charlie, is a rising star. But Charlie says disparaging things about his star-making TV show (and his girlfriend) in an interview and his fans turn on him and Josie dumps him. So he heads off to an unnamed tropical island and ends up getting kidnapped. Meanwhile, Josie tries to keep a foothold in Hollywood and pines for Charlie (but also contemplates an affair with an old This is a tedious and uneven info-dump. Josie is a fading former TV star whose heyday was 20 years ago. Her younger boyfriend, Charlie, is a rising star. But Charlie says disparaging things about his star-making TV show (and his girlfriend) in an interview and his fans turn on him and Josie dumps him. So he heads off to an unnamed tropical island and ends up getting kidnapped. Meanwhile, Josie tries to keep a foothold in Hollywood and pines for Charlie (but also contemplates an affair with an old co-star). Their story is told in omniscient present tense, which is annoying as hello. We get (unimportant) insights into not only the thoughts of the main characters but also of a nameless guy in a coffee shop, a random nameless casting director, a hotel consierge, etc etc etc. There is also talk of What Will Come to Be. There are reminisces about Josie and Charlie's past roles. It's all telling-and-not-showing. We're given unnecessarily detailed descriptions of the audition process, a detailed map of the unnamed (and quite possibly fictional) tropical island Charlie runs away to (down to the layout of the town, the feel of the tile on the bathroom floor and the print on the bedspread in the rooms at the resort). There is too much repetition (see: Charlie's neverending escape fantasies while he's kidnapped) and too many details and the story just slogs along. The novel is also tonally weird. It starts out like a breezy rom-com with the tropey misunderstandings and pining that go with it. But then it gets very tense, dramatic and dark at the end. And then it just ENDS, rather abruptly, and we fast forward and all is well. And since I'm so annoyed by this book, I'm ending this 'review' abruptly, too! Just skip this, unless you have insomnia. My main gripe is with the writing style, which is omniscient present tense, like the narration on Jane the Virgin, giving peeks into the future while focusing on the immediate present. It’s weird, and sometimes off-putting, and maybe a little tell-not-show. The good stuff, however, is about actors and acting, and the strange in-between of being yourself but not being yourself, and observing yourself doing that, and then analyzing your observations. Stewart does a good job of showing the process, the doubt, the constant mental revisions. Another bore for me, but others have liked. This one will please thriller lovers and those of us who would really rather not read another book about a woman in peril (or even a woman imperiling those who emperiled her, and so on) (and that would be me)--especially if what we really love is an insight into a world we'll never live in. This time, it's Hollywood stardom, and this is the story of a couple of actors rescuing their relationship from the spotlight--oh, and the guy getting kidnapped in the jungle. Let me just tell you, this one d This one will please thriller lovers and those of us who would really rather not read another book about a woman in peril (or even a woman imperiling those who emperiled her, and so on) (and that would be me)--especially if what we really love is an insight into a world we'll never live in. This time, it's Hollywood stardom, and this is the story of a couple of actors rescuing their relationship from the spotlight--oh, and the guy getting kidnapped in the jungle. This wasn't really for me. I abandoned it one-third of the way in. The writing was strong, but the subject matter and characters weren't really up my alley. I guess I don't really care that much about the craft of acting and the secret lives of actors, both currently popular and has-beens trying to make a resurgence 20 years after their heyday. I have so many other books in my stack, it just didn't hold my interest. I enjoyed this book so much! I especially loved the moments that explored what it means to be an artist in the world, how giving one's self over to pursuing art requires a particular and constant vulnerability. Twice I got mad at myself for leaving the book at home rather than taking it with me so I could sneak a few extra pages during the day. I read it quickly regardless, because I had to know what happened next. A disastrous magazine interview causes rising star and Hollywood hunk Charlie Outlaw to lose the love of his life and social media to turn on him. Ouch! So, Charlie decides to get away from it all by running away to a remote tropical island. It turns out it isn’t quite the escape he had planned. Delves deep into the psyche of the actor, exploring the process by which they approach their craft, their insecurities and the stress of fame. It also looks at what it is to be a victim and how traumatizi A disastrous magazine interview causes rising star and Hollywood hunk Charlie Outlaw to lose the love of his life and social media to turn on him. Ouch! So, Charlie decides to get away from it all by running away to a remote tropical island. It turns out it isn’t quite the escape he had planned. Free ARC from work. I picked it up because I'd seen some decent reviews and the cover looked so much like Where'd You Go, Bernadette's that I figured it might be worth a try. I really needed a zippy page-turner after reading several heavy and sad things (plus a few frustrating false starts). Perfect for a rainy weekend -- smart, suspenseful, decently witty dialogue. I expected to enjoy this more than I did, so 3 1/2 stars for a somewhat more than okay novel. Charlie Outlaw is a successful actor who flies off to a remote island when his actress girlfriend, Josie, dumps him, and the Internet turns on him. Disgruntled locals hatch an ill-conceived kidnapping plan, not even realizing Charlie is someone famous. The story toggles between Charlie's experience and the ex-girlfriend's life back in L. A. There is a lot of insight into the acting process, the actor's li I expected to enjoy this more than I did, so 3 1/2 stars for a somewhat more than okay novel. The story toggles between Charlie's experience and the ex-girlfriend's life back in L. A. There is a lot of insight into the acting process, the actor's life and how Charlie uses his acting skills to survive his ordeal. I enjoyed this book, it was a great one day read. Charlie Outlaw is a famous actor whose girlfriend Josie broke up with him after he publicly said some very stupid and embarrassing things. He decides the best thing for him to do is retreat to Costa Rica without telling anyone where he's going and lay low for a while. Meanwhile, in Costa Rica, a group of locals protesting a development decides that the best way to gain attention to their cause is to kidnap some tourists, collect the ransom and ge I enjoyed this book, it was a great one day read. Charlie Outlaw is a famous actor whose girlfriend Josie broke up with him after he publicly said some very stupid and embarrassing things. He decides the best thing for him to do is retreat to Costa Rica without telling anyone where he's going and lay low for a while. Meanwhile, in Costa Rica, a group of locals protesting a development decides that the best way to gain attention to their cause is to kidnap some tourists, collect the ransom and get some publicity. Charlie gets caught up in their scheme and gives a false name, and finds that acting skills aren't up to the challenge of getting kidnapped in real life. Josie, back in LA, is realizing she misses Charlie and tries to find him. The book goes back and forth between their two stories, which is a little distracting but makes sense towards the end. The plot was good, but the book got a little slow in the middle. I recommend reading it though! Really strange book, and I think I mean that in a good way? The narrative voice is not a style I usually care for, distant and omniscient, in everyone's heads which also can mean it's in no one's head. I never felt super close to any character but was still curious about their fates. Honestly the thing I found most compelling was the inside look at actors' working lives in Hollywood. It felt super authentic. The parallel storylines - one set in Hollywood, the other on a remote island where the char Really strange book, and I think I mean that in a good way? The parallel storylines - one set in Hollywood, the other on a remote island where the character is a kidnap victim - felt odd. Like, I never could decide if the tone was supposed to be satiric or funny or serious or wacky or suspenseful or emotional or what. I think part of that was the 3rd person omniscient voice which always felt like it was pushing the audience away a bit saying, "no stay over there I'm telling you a story." I loved the in depth look at what being an actor is like, the process and mentality that goes with it all. That part juxtaposed with the kidnap plot line felt weird at times and I wasn't super sure what the point was. Supposedly this is based on two separate true stories - one being that Benedict Cumberbatch was once kidnapped in South Africa. And honestly that fact kept me reading at times more so than the story itself. Like the kidnap plot just was super intense, or could have been, but up against a fluffier plot about a hasbeen actress trying to get work just seemed like maybe the kidnap situation wasn't as serious as it should be... Like was this a comedy? I have no idea. Terrific! Hilarious and full of insights about the acting profession, relationships, definition of the self, tips for kidnappers, and general philosophical stuff ... Well written. This is a fun read about celebrity (both sides of it), romance and adventure. And there’s a little bit of bad guys. It’s a fun read about celebrity peppered with advice from Stanislavski, et al. about the art of acting. There’s a terrific chapter that gives the reader an insight into the audition process. I'm the author of five novels: BODY OF A GIRL, THE MYTH OF YOU AND ME, HUSBAND AND WIFE, THE HISTORY OF US, and THE NEW NEIGHBOR. I teach in the creative writing program at the University of Cincinnati.